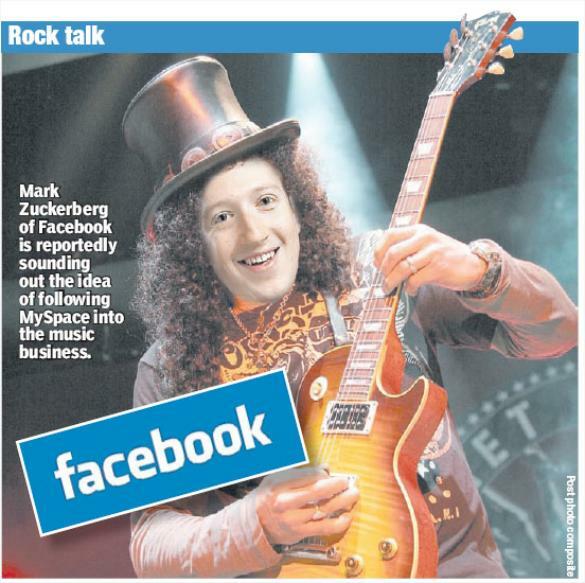 Facebook is indeed working on a plan to deeply integrate streaming music into its site, I’ve learned. The details of a rumor published last week in the New York Post are, from my understanding, basically accurate. The social network is considering a partnership deal with one of four companies, including iLike, imeem, LaLa and iLike’s streaming music partner, Rhapsody. Of course, Facebook may also try building its own service, or scratch the plans entirely. This move would make Facebook a major player in the music world, as it is the largest social network in the world with well over 100 million monthly active users. The music industry wants better access to these users. So far rival MySpace has taken center stage, especially with its new MySpace Music site. Music would also open up new revenue streams for Facebook, currently the less profitable of the two social networks. Few details are available about how that such a music service would actually work. But in keeping with Facebook’s design philosophy, it will almost certainly integrate with existing Facebook features like its fan pages for musicians and the news feed that shows you your friends’ activities, I’ve learned, and include song playlists and ways to purchase music. Last night, Facebook announced a new feature for any application built by Facebook or a third party, called “Action Links.” In the screenshot example it provided to show off the new feature, you can see that a user bought Beatles album Abbey Road through an app called “FBM” (Facebook Music? ), and you get the option to listen to the song “Come Together” from the album. It certainly looks very much like a mock-up of the new music service. Here’s why. Facebook launched “Fan Pages” for musicians last year, built around a Facebook Music homepage. The page lets a band or its agents upload tracks for users to listen to on their own pages, through a Facebook-built app called “Music Player.” This currently available Facebook Music homepage also offers a way for bands to sell merchandise, such as albums, through a third-party app called “MusicShop,” built by a company called MusicStore. That image was entirely made up by one of our engineers to show a hypothetical feed story and doesn’t represent a current or future product. However, it does seem quite along the lines of what Facebook is working on. Facebook chief executive Mark Zuckerberg will, as with other company decisions, make the final call on the future of the proposed music service. As the Post reported and I’ve confirmed, Facebook doesn’t want to have to deal with licensing streaming music directly from record labels. Facebook already shut down a third-party app called “Audio,” more than a year ago, because it let users upload and stream songs — and received takedown notices from labels. So which partner is Facebook likely to be working with on this new project? Rhapsody is a mess by any measure of popularity or aesthetics; Lala keeps launching new products to lots of fanfare but never seems to get traction. So that leaves iLike and Imeem. ILike has offered a wide range of music apps for Facebook and other social networks even before Facebook launched its own musician pages. ILike’s Facebook apps include music-related games, a way to find local concerts and buy tickets, and more. The company also has a free-standing site for music fans, iLike.com, apps on other social networks, and plugins for desktop music players, but its Facebook apps have comprised the core of its traffic. And the company has had a delicate time keeping Facebook at bay so far. When Facebook launched its own musician pages, last fall, iLike already had musician pages — it managed to get some of its own pages designated as official pages in place of Facebook’s. Today, iLike is one of two officially designated “Great Apps.” One benefit of that designation is that when a friend takes an action on an iLike Facebook app, information about that action is more likely to appear in your news feed, thereby increasing usage of the application. But iLike doesn’t have its own music-streaming deals in place, instead it licenses Rhapsody’s streaming service. So now we’re down to imeem. With its own streaming music platform, it’s looking like a good option, as Wired’s Listening Post blog notes. Imeem’s licensing deal with labels lets it stream music through widgets on other sites, as well, which fits with Facebook’s plans. Facebook is also busy rolling out Connect, a service that lets other web sites access Facebook data; through imeem, Facebook could include streaming music as part of its Connect service. Both imeem (pictured below) and iLike (pictured above) offer feeds of information about user activity, and help you find what people around you are interested in, so they’re product-wise in line with Facebook’s design philosophy. ILike’s advantage on that front is that it is the leading Facebook music app; while Imeem has a couple apps on Facebook, but they’ve hardly generated the same traction. Also, if Facebook turns its back on iLike, it’ll be a huge blow to Facebook’s tradition of letting external developers operate on its platform. Facebook is already facing a big backlash on that front. The social network’s new redesign has basically killed the ability of many applications to reach users, largely because widget-style frames for applications are no longer allowed on main profile pages. If Facebook partners with anyone besides iLike, or builds its own music streaming service, the “Great Apps” program will basically be what many third-party developers have already accused of it of being: A marketing gimmick. And if Facebook cannibalizes iLike, how can any successful third-party developer think its product safe from the same fate? It’s for that reason more than any other that I originally trashed the Post rumor. It now appears that the benefits of having a great music service on Facebook may outweigh the cost to Facebook’s reputation. The act of listening to music can keep users on a site much longer than they might otherwise stay. And you need to keep users on your site if you want to serve them more ads and lead them towards other monetizable actions, like buying gifts. Who knows, Facebook could even implement a subscription-based music service. One thing’s for sure: Facebook needs to start making a lot more money if it is ever to go public, and music could play a role in that.